Etihad wins World Travel Awards (WTA) title for the World's Leading New Airline for the third year in a row in 2006. The Abu Dhabi-based National Airline of the UAE has undergone unparalleled growth during 2006 with the momentum set to increase even further during 2007. "The last 12 months at Etihad has witnessed a major transformation in all areas of the business, and strengthened our place at the very forefront of the aviation industry," said James Hogan, CEO, Etihad Airways. "From award-winning Pearl Zone business bed to a significant increase in routes and holiday destinations, Etihad really has set the benchmark for others to follow during 2006, and we are confident this trend will continue into 2007 and beyond," he added. Etihad once again triumphed at the prestigious World Travel Awards (WTA), not only winning the title for the World's Leading New Airline for the third year in a row, but also the award for the World's Leading Flat-bed Seat. In 2006 Etihad launched 16 new international destinations which included New York, Paris, Casablanca, Khartoum and Jakarta. Guests were also able to travel to Islamabad, Lahore, Peshawar, Manchester, Doha, Jeddah, Muscat, Kuwait, Tehran, Dhaka and Manila. A record four million Guests are anticipated for 2007, with tickets for 37 new routes in just 37 months now available - including the highly prestigious service to New York which opened in October. The Kuala Lumpur route is also on set for launch on 16 January 2007. Currently, 80 percent of Etihad's fleet is brand new which is unprecedented in the world of air travel. The fleet has become one of the youngest in the world with the twenty-third aircraft, a three-zone A340-500, arriving in Abu Dhabi in December. The new A340-500 forms part of the airline's record $8 billion order, which was made in 2004 for 29 new Airbus and Boeing aircraft. 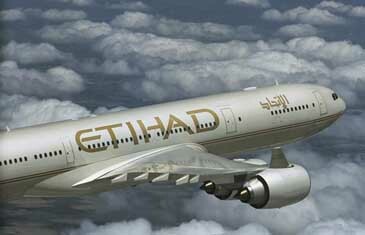 The latest addition to Etihad will now join a fleet which includes nine A330-200s and five Boeing 777-300 ERs. As the past 12 months witnessed unprecedented growth at Etihad, its staff grew to more than 3,400 working across the world, comprising over 90 different nationalities. One of the highlights of 2006 was industry recognition for the Pearl Zone business-bed, available across Etihad's new fleet of Airbus and Boeing aircraft. Reclining a full 180 degrees into a flat 6 feet 1 inches bed with a built-in massage facility to help Guests relax, it became the World's Leading Flat-bed Seat at the World Travel Awards. The revolutionary Diamond zone suite was also unveiled, with the ability to recline 180 degrees into a flat bed, and rotate 180 degrees enabling Guests to hold meetings, dine and converse with one another. Etihad's cargo division, Crystal Cargo, has continued to grow at an astonishing rate, with an estimated 100,000 tonnes transported by the end of this year, compared to just 20,000 in 2004. The figure is widely expected to exceed 200,000 tonnes in 2007. As 2007 begins, Guests now have the option of flying to more than 80 different destinations with Etihad Holidays, and choosing from more than 300 holiday options. Having expanded rapidly during 2006, Etihad's Holidays Division offers an extensive choice of quality hotels in many of the world's most desirable cities and resorts. New brochures for inbound holidays in the UAE and winter ski resorts were also launched. "It has truly been a momentous year for Etihad, with the industry recognising the advances we have made at the World Travel Awards. Leading the way forward in terms of our business ethic and growth is something we greatly look forward to in 2007," concluded Hogan.